When it comes to decorating our homes for the holidays, Christmas is the most wonderful time of the year. Easter doesn't even come close. But that's only because decorating our homes for Easter isn't a usual tradition of popular Australian culture. Yes, we eat hot cross buns and we have Easter egg hunts and we gorge ourselves silly on chocolate eggs and the Easter bunny is everywhere. But our homes are usually free of tinsel and baubles and fake trees and wrapping paper and all the winter wonderland decorations that don't make much sense in our sizzling hot Aussie Christmas. However, that's all about to change! 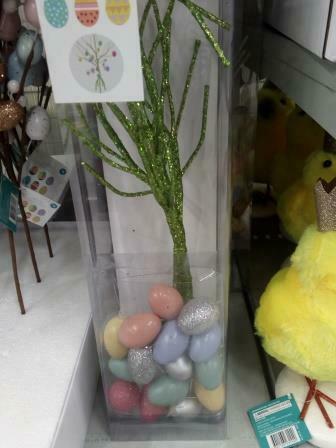 Easter decorations have been making their appearance in our stores for quite a few years now, with Easter decorating becoming increasingly popular in Australia. 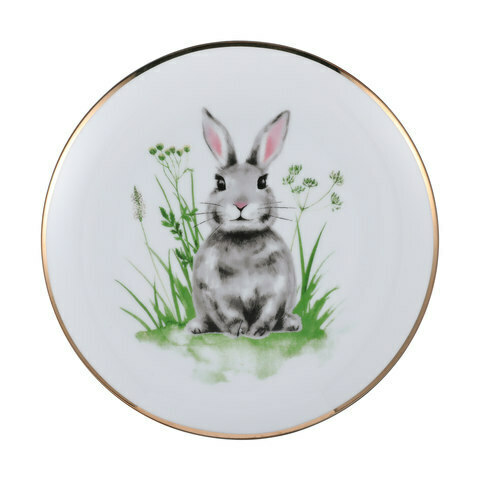 Even though it's autumn here and winter is coming, the traditional European themes of spring and bunnies and eggs predominate during Easter. And you'll find lots of joyful and very affordable bunny and egg decorations (and plenty more) at Kmart. 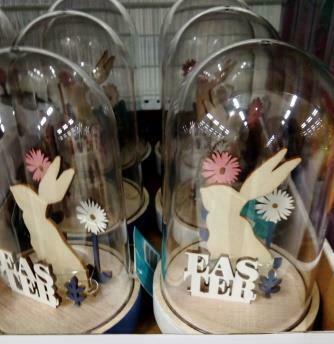 Kmart has a wide range of colourful, joyful and festive Easter pieces for your home. 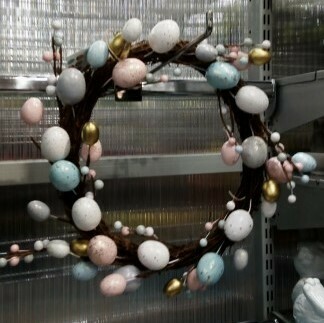 Such as this beautiful Easter egg wreath, priced at $12. 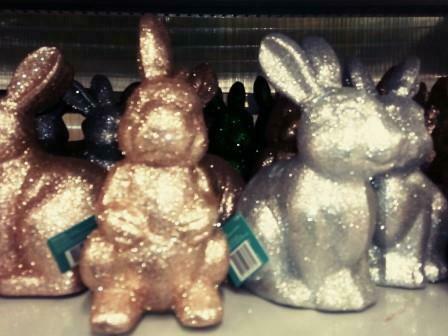 Or these gorgeous glitter bunnies priced at $4 each. I love these light up Easter domes which make a beautiful centerpiece ($10 each). 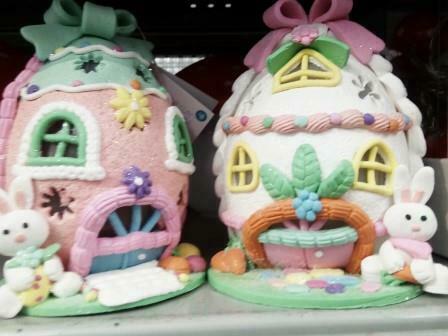 And these absolutely delightful light up Easter houses made out of clay dough ($8 each). 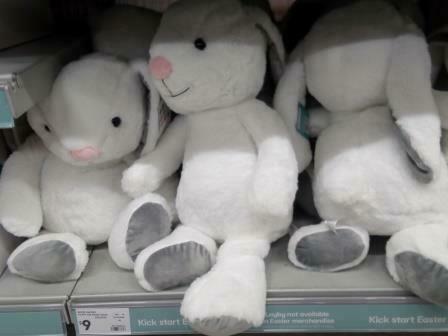 There are plenty of cute and cuddly bunny soft toys and other farmyard animals to add a joyful touch to your decorating such as these plush white bunnies priced at $9 each. And of course, Easter isn't Easter without Easter chicks! 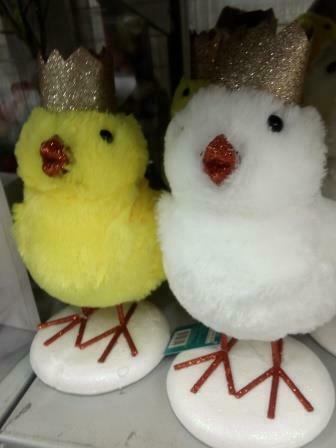 These fluffy royal chicks are 24cm tall ($8 each) and come with a glitter crown. Kmart also has Easter trees. The Easter tree has been around in countries like Germany for centuries (which by the way is also the traditional home of the Christmas tree!) and I think it's great that Australia is finally catching on. This is a mini Easter tree set which includes mini egg decorations. Priced at $10 a set. 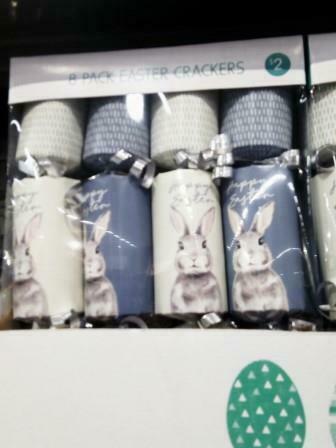 These bunny side plates add the perfect touch to your Easter Sunday table (set of three plates: $8) as well as these adorable Easter crackers ($2 for a box of 8). 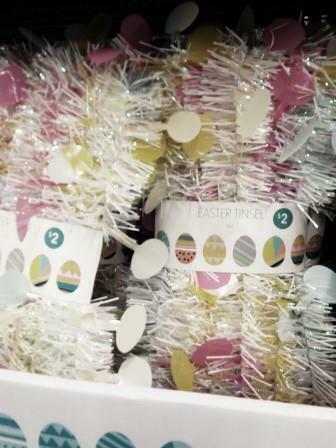 Easter also has its own tinsel at Kmart! Like the one below, priced at $2. 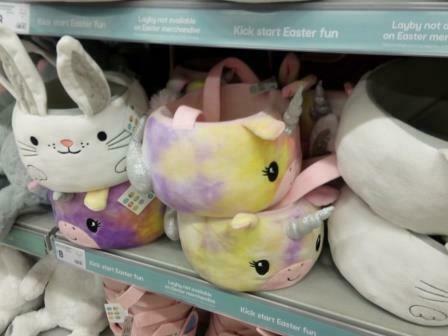 And of course Kmart has lots of goodies for your Easter egg hunt including egg hunt baskets such as the ones below. You'll find so much more at Kmart to prepare you for Easter including Easter party décor, Easter gift bags, Easter cards, Easter egg hunting packs, Easter craft kits, and of course, a huge selection of Easter eggs! There really is no need to spend big this Easter. 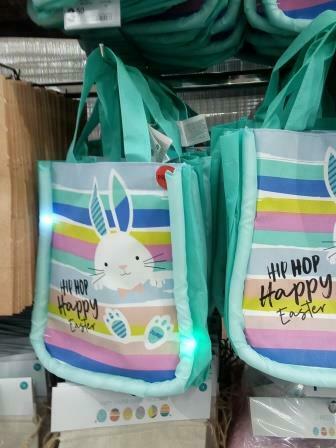 Hop to your local Kmart and get ready for Easter without breaking your budget. Tuggeranong Southpoint, cnr Anketell and Reed Streets, Tuggeranong. Open every day 8am-10pm. Westfield Belconnen, Emu Bank Road, Belconnen. Open every day, 24hr. Marketplace Gungahlin, 33 Hibberson Street, Gungahlin. Open everyday 8am-10pm. Kmart Queanbeyan, 30 Morriset Street, Queanbeyan. Open Mon-Fri 8am-midnight, Sat-Sun 8am-9pm. 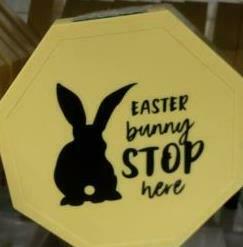 Visit your local store or the Kmart website here for more Easter ideas.